The Moon has less gravity than the Earth, so a dropped or thrown object takes longer to land. 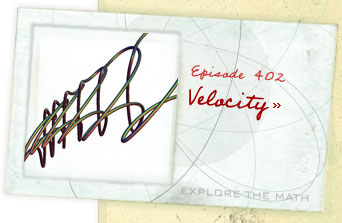 In this Demonstration, the times and trajectories of hurled objects are plotted for various planets. 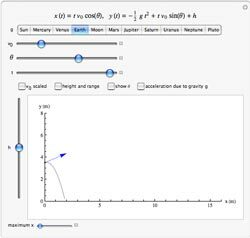 Explore the quantum mechanical probability density for two particles in a one-dimensional square well with infinite walls. analyzes anything with an engine. 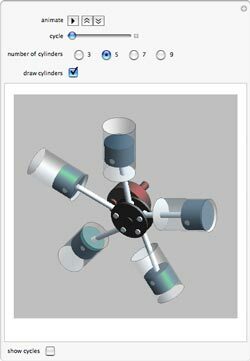 This Demonstration shows a working model of a four-stroke radial engine. Unlike a straight cylinder engine, the cylinders are connected to the crankshaft via a single hub with a master-and-articulating-rods assembly. This engine configuration was very popular in WWII aircraft. For smooth firing order, most four-stroke radial engines have an odd number of cylinders. This Demonstration shows snapshots of a disk rolling on a plane. For the calculation, it is assumed that the disk has infinitesimal thickness, rolls without friction, and does not slide or slip. A rolling disk is one of the simplest examples of a nonholonomic system. It is completely integrable, and as a result, the sequence of snapshots form nonchaotic sequences exhibiting a certain symmetry. The APPLE falls from the tree. 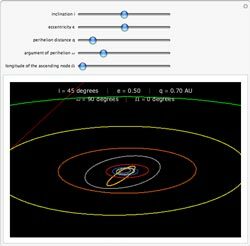 Use this Demonstration to explore the five parameters which characterize orbits about a central mass. Four rods are attached to each other with hinges at the vertices of a rhombus. Two of the sides are extended, with balls attached at their ends. The top vertex has a constant height. 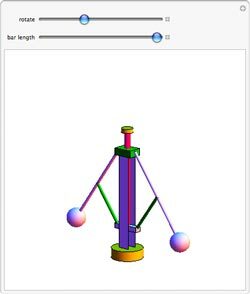 As you rotate the whole assembly, the balls move upward due to centripetal force. The circumference of a unit circle is 2π, or about 6.28.
equations of motion and the law of universal gravitation. The SOLAR SYSTEM -- planets in motion around the sun. This Demonstration shows the orbit of a test mass in the gravitational field of a homogeneous sphere. Assume that the test mass can penetrate the sphere without frictional forces being exerted. Inside the sphere, the gravitational force forms a harmonic oscillator and outside the sphere, it has a pure Coulomb potential. In both cases, the orbits are ellipses. 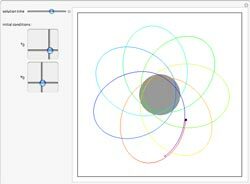 In case the orbit has segments both inside and outside the sphere, rosette orbits are obtained. 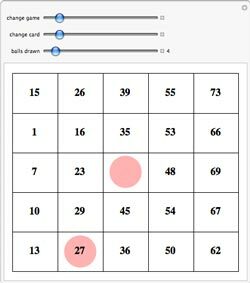 In the game of Bingo, players must be the first to meet various spot-filling criteria: a row, column, or diagonal; a "T"; an "H"; all spots filled, etc. The most common game is to be the first to fill five spots in a straight line.